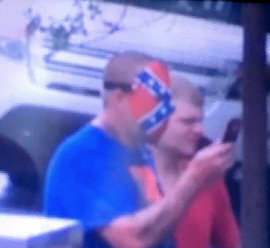 A Florida man wearing a hockey mask painted with a Confederate flag was arrested Friday after refusing police directions to remove the mask as he took part in a protest in support of keeping a statue of a Confederate soldier that was erected outside the county courthouse. 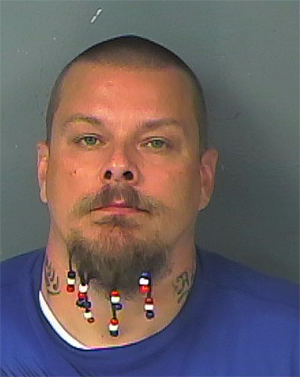 Ryan Hawks, 39, was collared in front of the Hernando County courthouse for wearing a mask or hood that concealed his identity. According to police, Hawks “approached several law enforcement officers while wearing the mask and was advised of the law violation.” Upon being told a second time that he was breaking the law, the 6’, 240-pound Hawk reportedly replied, "You want me to remove the mask? Good luck with that." Hawks was freed from jail late Friday night after posting $500 bond. According to court records, Hawks’s rap sheet includes a felony grand theft conviction for which he was sentenced to probation. Upon violating terms of his release, Hawks was sentenced to nine months in the county jail. A father of four young children, Hawks was working in the kitchen of an Applebee’s at the time of his 2013 probation violation.